George and Amal Clooney brought glitz and glamour to Edinburgh as they arrived in the city to collect an award for their charity work. They have been presented with prestigious Postcode Hero awards in recognition of their work to safeguard human rights by Scotland’s First Minister, Nicola Sturgeon. The couple also received a cheque for £1 Million raised by players of People’s Postcode Lottery. 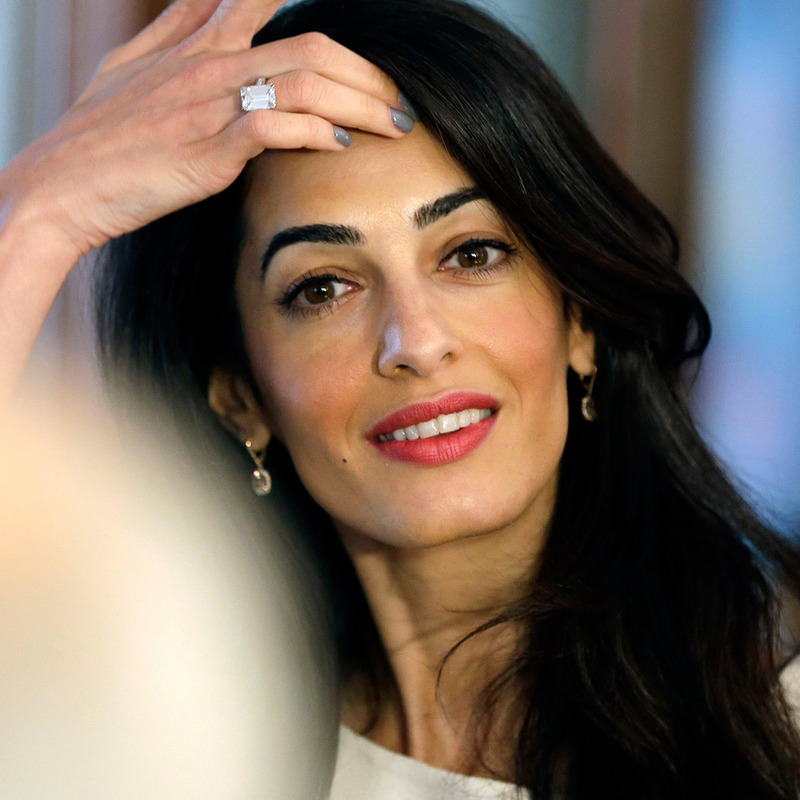 The money will help fund TrialWatch – a project run by the Clooney Foundation for Justice. The Foundation now plans to increase its monitoring of trials in countries where human rights are at risk. The presentation was one of the highlights of People’s Postcode Lottery’s Charity Gala, held at the University of Edinburgh’s McEwan Hall. During the event, Amal and George Clooney were interviewed by the broadcaster and Save the Children charity ambassador, Natasha Kaplinsky. They spoke passionately about the need to protect and enhance human rights. Following the interview, the Clooneys were presented with their awards by Nicola Sturgeon. The First Minister said, “Amal and George Clooney are worthy recipients of these Postcode Hero Awards which recognise their outstanding commitment to improving people’s lives and ensuring some of the most vulnerable people in our world get the justice, opportunities and support that they need. This funding from People’s Postcode Lottery will support the Clooney Foundation for Justice’s powerful work to advance justice for marginalised or persecuted groups, refugees and displaced children. The prominent women’s rights campaigner, Nice Nailantei Leng’ete, was also presented with a Postcode Hero award in recognition of her work to end Female Genital Mutilation/cutting amongst Maasai communities in Kenya. Ms Leng’ete also received a cheque for £500,000 for Amref Health Africa UK. Speaking about her own story and the charity’s work, Nice said, “After nearly four years of dialogue, the elders in my village changed hundreds of years of culture and abandoned cutting. The number of girls attending school soared. “With Amref Health Africa’s support, the campaign spread to neighbouring villages and eventually to the highest seat of Maasai power. The players of People’s Postcode Lottery are helping us achieve our ambitions to end Female Genital Mutilation/cutting altogether. The annual People’s Postcode Lottery Charity Gala is a celebration of the vitally important work done by the charities which are supported by our players. In 2018 alone, more than £100 Million was awarded to charities working in Britain and beyond. In total, players have now raised more than £404 Million for charities and good causes. Clara Govier, Managing Director of People’s Postcode Lottery said, “It was our honour to welcome George and Amal Clooney, Nicola Sturgeon and Nice Nailantei Leng’ete to our Charity Gala. The couple have been honoured for their international humanitarian work through the Clooney Foundation for Justice. He said: “The lottery is unbelievable what they do. “The idea that an entire neighbourhood can have a great time and make some money, and in the meantime [help] hundreds and hundreds of charities across the world. There is a person who loves to STEAL my IDs … please stop this or credit my blog. I am working very hard so respect it . What a nice man George is. If you look at Amal, George has to practically pull her to move forward because she’s posing and loving the cameras. I got a chuckle. Many of the photos look like a director told Amal “baby … make it look like you’re making love to the camera…” and she obliges. Her face is a cross between obsession and Velveeta sultry. Hahaha! I love them both. George is great, isn’t he? And Amal looks fantastic. I usually don’t like Stella’s designs, but this jumpsuit is really cool. The jumpsuit works, even the length, as I generally don’t like them short on tall gals. Love the exaggerated pockets and belt. Very classy. Would someone please tell her to pull her shoulders back. She’s doing the tall girl self-conscious stance. I know Amal. She’s 5’8” but likes to say she’s 5’9” and she always wore heels so she looked very tall. She loves to stand out in loud prints and tall heels. She used to be heavier, not fat, still slim but not evacuated.